For a showstopper that doesn’t involve any baking, this is hard to beat. Chococo the chocolate experts have created this amazing recipe that requires no baking at all. You will just need to give yourself enough time to make all the elements. 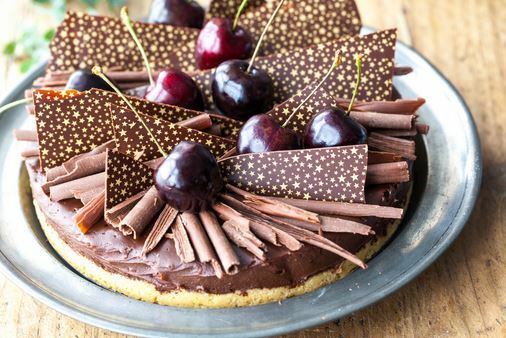 However, if you don’t want to decorate it with chocolate shards & curls, don’t worry, cherries piled into the middle of the tart & sprinkled with icing sugar just before serving would look just as stunning! To make the biscuit base for the tart, gently melt the butter & light soft brown sugar in a pan and crush the shortbreads into powder using either a food processor or by putting the biscuits into a strong plastic bag and bashing them very well with a rolling pin. Mix the biscuits with the melted butter & sugar mixture, press firmly into the base of the cake tin and put in the fridge to chill. Whilst the base is chilling, put the cream, sugar and salt for the ganache in a heavy-based pan and warm gently to melt the sugar. Stir this mixture continuously and take it off the heat as soon as it comes to the boil. Add the chopped chocolate & butter, stirring gently to melt together and form the ganache. If the chocolate doesn’t all melt, put the pan back onto a very gentle heat stirring gently all the time to ensure that the mixture doesn’t catch on the bottom of the pan. Then add the kirsch juice to taste (if just 1 tbsp doesn’t do it for you!). Set aside to cool for at least an hour. By the way, if the mixture “splits” (doesn’t blend) on you, stir it vigorously to re-blend once it has cooled. If that doesn’t work, you may need to add a little more warm cream to help it re-blend into a smooth shiny “emulsion”. Place 100g of griottine cherries in a shallow dish & pat dry with kitchen roll to remove excess kirsch juice. Pour a thin layer of the cooled ganache onto the chilled base and sprinkle the cherries before covering them with the rest of the ganache and leave to finish setting in a cool place for several hours. Ideally, you would put this tart in a cool, dry room to set rather than in the fridge as this will help maintain the shine on the top of the ganache. If however, your only option is the fridge, put it in there to set. You can simply decorate the tart with cherries &/or other berry fruits or have some fun with melting chocolate to make shards & curls whilst the tart is setting! To make the chocolate shards & curls, melt 150g of the 250g of dark chocolate in a bowl sitting over a pan of gently simmering water (the water must not touch the bottom of the bowl). As soon as it has melted, take the bowl off the heat, add the remaining 100g of chopped chocolate and stir gently to melt into the liquid chocolate. This will bring the temperature of the chocolate down to the right ball park to work with. As soon as the chocolate has melted together, spread a thin layer across the edible pattern on a baking tray. If you don’t have a printed edible pattern sheet, you can use thick plastic, eg: a laminating pouch. Cut different sizes of triangle shapes into the chocolate before it sets hard. Put in a cool room or fridge to set (it shouldn’t take long as it is so thin). Don’t try to peel the chocolate away from the transfer too quickly though, it needs a bit of time for the pattern to transfer onto the chocolate! With your remaining melted chocolate, pour it onto a cold surface in a thin layer and soon as it starts to set, scrape a cold knife away from you in short sharp motions to create curls. When you are ready to serve, remove the tart from the tin and enjoy decorating it to your own design. Use a hot knife to cut slices from the tart and serve with whipped cream for the full Black Forest experience!